Slash says that while he enjoyed watching the Motley Crue biopic The Dirt, he can’t see a similar film about Guns N’ Roses being made. 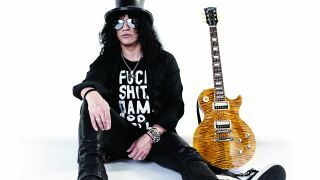 Speaking about The Dirt, Slash says: “I saw it, I liked it, I think it's great. It took me back to the days of the 80s – I remember everything. This gave me more details that I didn’t know. “I wouldn’t like a Guns N’ Roses movie like that – I can’t imagine trying to find someone to personify the members of the band! I don’t see it being possible. Guns N’ Roses were recently confirmed for the Louder Than Life festival in Louisville, Kentucky, on September 27-29 – and Slash says that other shows could follow later in the year. He says: “With Guns N’ Roses, we have a little tour between September and October. There’s been a lot of talk about an eventual new album with Guns N’ Roses, but in reality we haven't done anything, so we can focus more on that there. Will Guns N’ Roses have new material out by the time the live shows come around?